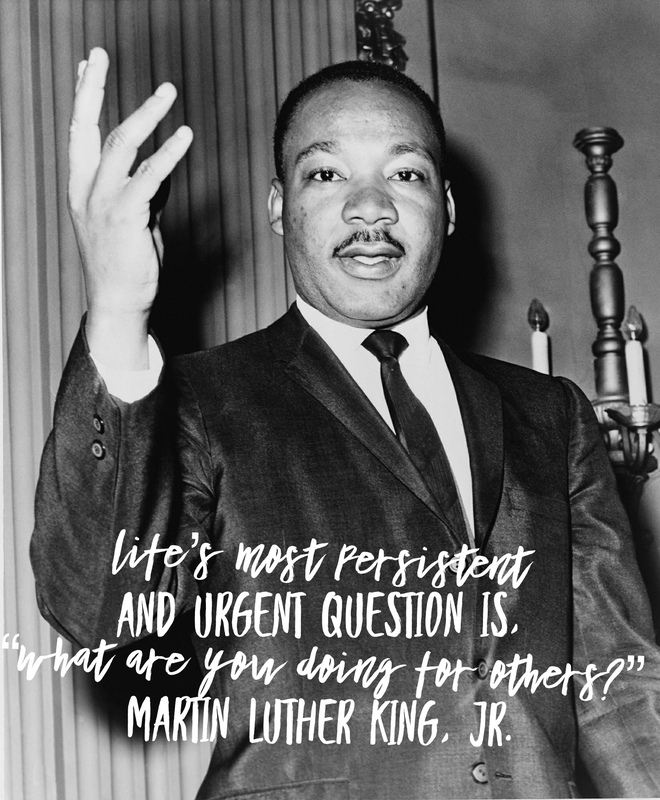 Today, in honor of Martin Luther King, Jr., I encourage you to find a way to serve others. Not sure where to start? Check here for some resources in your area. 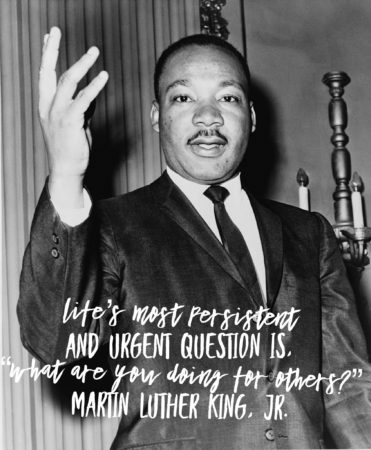 It doesn’t have to be today but today is a great day to consider what your commitment to helping others is and how you can grow that commitment into something more. I firmly believe that if you find the right way to give back it will change your life for the better. Whatever you decide, do it with an open heart and a cheerful spirit. Remember that you can’t help everyone, but you can certainly help someone. Great reminders! We are doing a clothing drive for a local warming shelter. Small things that make a big difference. I concur—this is a good reminder. My way of serving is to lead a knitting group at church to provide warm hats and scarves for homeless people and other needy people. Today was my day to go grocery shop for 60 people. Because tomorrow is my monthly date to serve lunch to a group of seniors at our church. They are such a great group and game to try whatever we whip up. Hopefully, today’s freezing mist and snow will clear up so they won’t be afraid to come tomorrow. Even a hard day of serving others leaves me feeling better than I started. But I think that is true for everyone once they find a place to serve that fits their skills, talents, interests and passions. I spent my morning with Meals on Wheels. Wow, are people ever grateful for the services they provide, and I’m grateful I got to be a small part of that. Thanks for the reminders! I’m giving a shout out to Family Promise. Not sure if there are any congregations in your area which participate, but this is a wonderful group. They assist homeless families in securing housing. Congregations house carefully screened families for a week at a time four times a year. They work with the families on a variety of issues such as money management, ensuring that they are hooked up with appropriate services such as health insurance, etc. Our agency has a very successful record of placing 80% of the families in housing by 8 weeks. Our church will be housing the families next week. What a lovely sentiment, Carole, and so very true. Giving back helps others, but boy does it help the giver as well. Wonderful reminder, Carole – and what a great image! I spent much of today helping my mom (not exactly “volunteering”, but still) and I’m so grateful for the opportunity. Most certainly time well-spent! A great reminder-even if you help one person that makes a difference.